Delicate tones to expand your photography business! Boost your business performance with this lovely referral card template! Referral cards are some of the most powerful tools when it comes to advertising. They are exceptionally popular and can be used by your clients to give business reference to their family and friends thus making you more visible than ever before. As a matter of fact, you too might have done business with someone in the past after receiving a referral card or even a business card. This clearly shows you how much you can achieve using referral card templates to design your own cards. Your referral cards could also act as your business cards, giving your clients something that reminds them of your contacts and the services you offer. Your clients can vigorously refer their friends with the assurance of credits that they and their referrals will receive in the process. 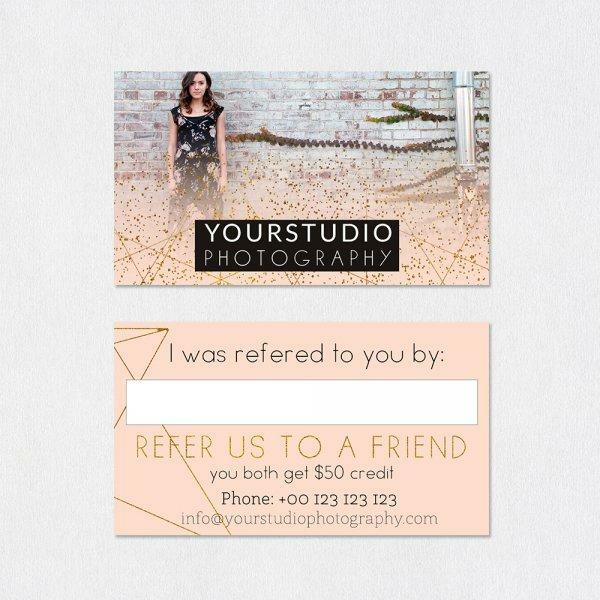 Sleeklens has a number of referral card templates which you can use to design your own cards and have your clients bring business to your studio with ease. These coupled with your professional photography skills will help grow your business and take it to the next level. Just order any of these templates and enjoy awesome advertising tools for your business. A pleasant smile is absolutely welcoming when doing business and Pastel Greetings works just the same way when your card designs are handed to your prospective clients. 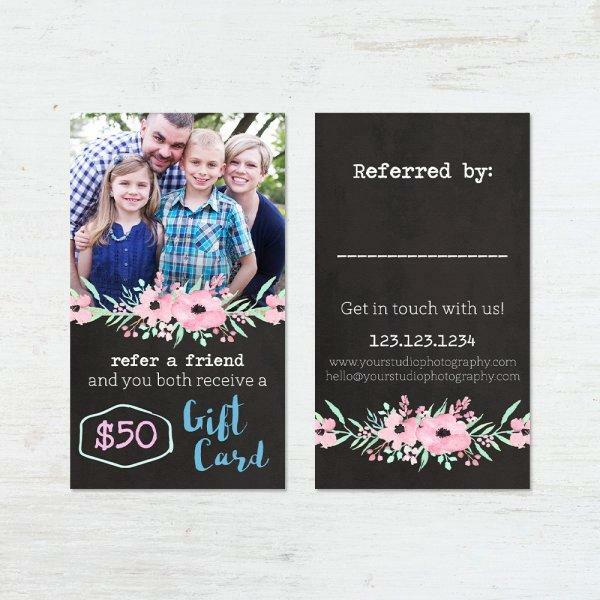 When you need cards that will create an inviting impression and charm your clients into doing business with you, this referral card template will be the best platform to use any day any time. It has a dimension of 9.5 by 5.7 centimeters, an ideal size for anyone to slip into their card holder or anywhere they wish to store it. This colorful template gives you the exactly kind of cards you would want to display before everyone including those with the best of tastes. It is easy to work with and you do not have to be a graphic designer in order for you to create some cute cards. It comes with some instructions to help you go along with your designing process and since it’s premade, all you have to do is add your images with the help of clipping masks and edit the text to convey your message. This template is cost-effective and does not come with any monthly or annual subscriptions. We all have superb dreams and aspirations of what we would like to see happen to our photography businesses. However, it is good to appreciate the need to put in some effort especially when it comes to marketing. While some strategies could prove hectic and costly, the use of this referral card template could prove to be easy, efficient and very productive. First, this template is cheap and does not attract any kind of subscription fee and once you make your purchase you will be able to design as many cards as possible. It has a colorful and captivating background that will dramatically help come up with unique cards which you’ll be proud to dish out to your customers. With this template, you will be able to empower your clients to tell others about your business thus creating more possibilities for your expansion. It is a 9.5 by 5.7 centimeter flat card and comes with two file options – front and back. It also comes with clipping masks for easier insertion and resizing of images thus making your work quicker and smart. Exquisite Reverie also features Layered Photoshop (PSD) files of 300 dpi for high-resolution results. Just use this template to cut the cost of marketing and let thousands know about your studio and professional photography. Want to attract more customers without overstretching your budget? Use Smiles to create beautiful cards that will have everyone wanting to meet you. As the saying goes, there has never been an ugly smiling face and truly you can never get it any wrong while using Smiles referral card template. The customizable template comes with a lovely design and your work is absolutely simplified for you. All you need to do is add your images and come up with your marketing wording and you are done. The template allows you to edit the text fully and you can add your photographs or studio logo by simply dragging and dropping them on the canvas. You can showcase your unique photography skills as you design your cards and use this to attract more customers without breaking a bank. With this small and colorful 9.5 by 5.7 centimeter flat card template, your photography business can hit the runway and take off in an unstoppable way. Each of these templates are designed for Adobe Photoshop and are compatible with Photoshop Elements 6+, Photoshop CC and Photoshop CS+. With any of these versions installed on your Windows or Mac computer, you will be ready to experience great marketing results with very minimal efforts and stress. Just prepare your message, mini session charges and create your cards in a matter of minutes. Cards created using these referral card templates can be printed in any big Pro labs at a very low cost.